WASHINGTON — The idea of separating migrant children from their mothers was discussed during the earliest days of the Trump administration as a way to deter asylum-seekers, according to notes from a closed-door DHS meeting. Notes from a town hall held for Citizenship and Immigration Services asylum officers on Feb. 2, 2017, show that the agency's asylum chief, John Lafferty, told the officers they might have to "hold mothers longer" and "hold children in HHR/ORR," an acronym for facilities for children run by HHS. Notes from the meeting were first obtained by MSNBC. The Trump administration has repeatedly maintained that the increasing number of children being separated from their mothers at the U.S. southern border is not a policy of its own making but just a tragic byproduct of enforcing the law against illegal border crossers. Department of Homeland Security Secretary Kirstjen Nielsen said on Twitter Sunday: "We do not have a policy of separating families at the border. Period." She added that asylum-seekers would be protected from separations as they always had been: "For those seeking asylum at ports of entry, we have continued the policy from previous administrations and will only separate if the child is in danger, there is no custodial relationship between 'family' members, or if the adult has broken a law." But in the town hall two weeks after President Donald Trump's inauguration, Lafferty laid out a number of policies specifically intended to lower the number of immigrants claiming asylum. 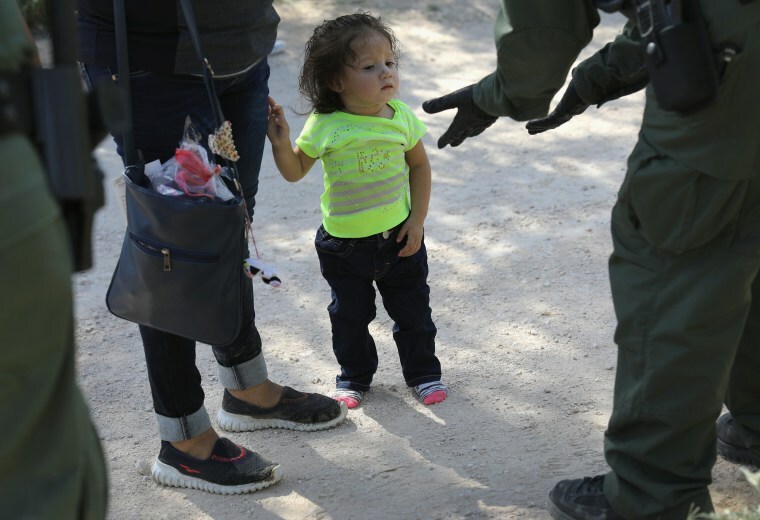 According to the notes, he provided attendees with the latest asylum numbers, which were at their highest point in 20 years in 2016, and then said the administration was "in the process of reviewing" a number of policies, including separation of parents and children, to try to curb those numbers. Some of the proposals, like raising the bar for passing the initial interview for claiming asylum, have already been implemented. Other policies, like detaining "almost everyone coming over," have run into logistical difficulties. Nielsen and Attorney General Jeff Sessions say women and children will only be separated when they are caught crossing the border "illegally," which they define as crossing between designated ports of entry. NBC News has found that some women are separated from their children even if they are legally claiming asylum and not being referred for prosecution. In those cases, the children are kept in the same facility, but they are still separated for days without being told whether they will be reunited. Former USCIS Director Leon Rodriguez, who served under the Obama administration, said families who presented themselves for asylum between ports of entry were not previously prosecuted. "We understood that the border had to have integrity," Rodriguez said. "But we also had a pretty deep awareness of why people were coming. There were deep humanitarian issues that were driving them here." DHS did not respond to a request for comment. There is no evidence to date that the new policy has deterred families from crossing between points of entry. The monthly totals decreased from 9,653 in April to 9,485 in May, the month the policy was enacted.